Best Chinese Knives: Microtech Anax Style Integral Aluminim Handle Knife - Improved version from Green Thorn! 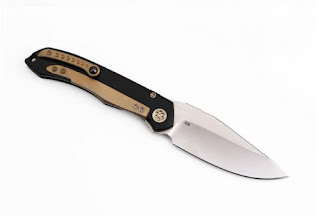 Microtech Anax Style Integral Aluminim Handle Knife - Improved version from Green Thorn! Microtech Anax model came out a few years ago and instantly became one of Microtech's most interesting models. Most of the interest came from an integral handle, ball bearings in the pivot, awesome blade grind and the wicked Ti lanyard. The party killer in this case was the +$1000 price tag. The future of the model is uncertain at this time because of ZT claims to the subframe lock used in it. Our Chinese friends also liked this model very much and Wild Boar released the first version, using aluminium instead of titanium to cut costs. The model received great feedback. Now, Green Thorn released the upgraded version of the knife. The differences are better gimping (looks more like the original), bronze anodized hardware and overall better Green Thorn quality control. I don't know if it is worth the extra cost compared to the Wild Boar knife. I hope they do a titanium handle version even if it shall be more expensive. (S35vn version will be nice too). I think the price will drop in the near future, if this happens I will update.